Well, I sort of have a finish for this week. I have finished all the chevron units for our swap coming up at the end of November. All 288 of them. Yes these did take awhile to sew together, but I did get some purple and blue bonus half square triangles to use in a couple of other projects! Now I just have to pack them up and get to Sandi by the end of the month. 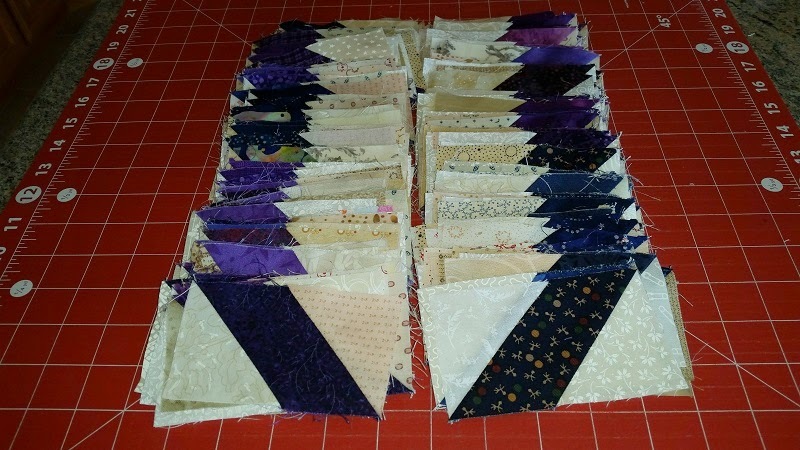 These units will be used in Bonnie Hunters Midnight Flight quilt from her new book. You can check it out here. So really, nothing added and nothing subtracted for this week. Hopefully soon! Purchased this week: 0 yards. See how everyone else is doing at Patchwork Times.